Celebrate the bond of family with this stunning sterling silver charm from Chamilia. 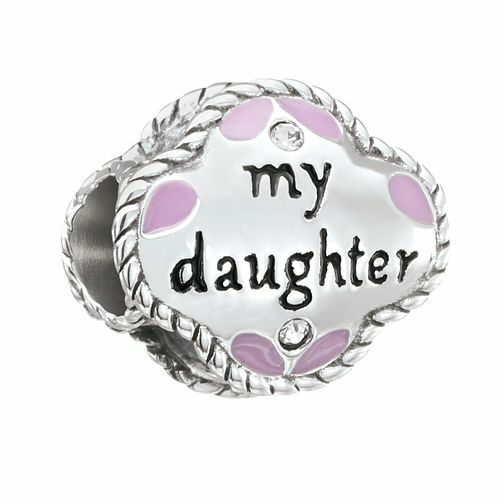 With the words My Daughter set on one side, and My Friend set on the other, this charm also features pretty purple resin and shimmering Swarovski crystal and is finished with rope design edging for a stylish look. Chamilia My Daughter My Friend Charm with Swarovski Crystal is rated 5.0 out of 5 by 7. Rated 5 out of 5 by Anonymous from Item was as good as it looked on the picture. A good experience all round, easy ordering, fast delivery and very pleased with the item ordered.